Everyone knows the story of Enron. At its height, it generated revenues of nearly $101 billion, and Fortune Magazine named Enron "America's Most Innovative Company" for six consecutive years. But Enron’s CFO Andrew Fastow had set up a number of special purpose entities which allowed Enron to hide debt, allowing it to maintain the appearance of a strong balance sheet and keep its critical investment grade credit ratings. But in reality, the picture they were painting was not accurate and it was essentially a big shell game. 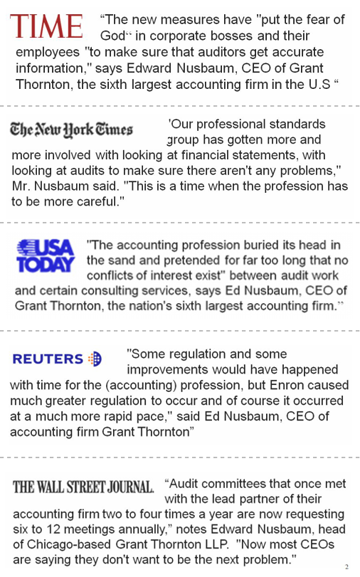 the AICPA should coordinate a review of the audit methodologies of the major accounting firms. 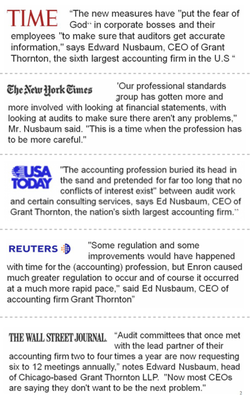 There was substantial positive media coverage including an appearance by the Grant Thornton CEO on PBS-TV. 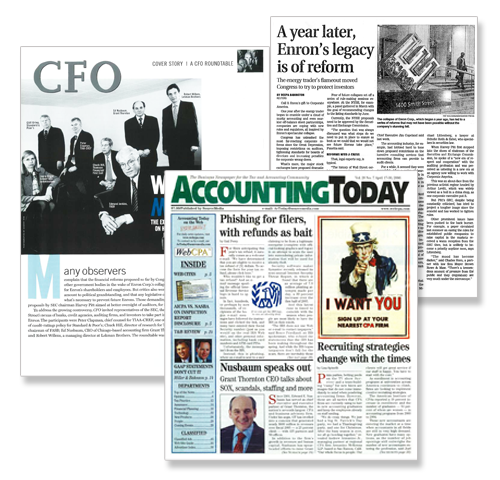 Grant Thornton CEO was asked to be part of a luminary group panel article in CFO Magazine. Thought leadership coverage included Time Magazine, New York Times, USA Today, Reuters, Wall Street Journal and the Associated Press.